And the shows continue on! Peter Copping showed another stunning collection for Oscar de la Renta, Phillip Lim and Alexander Wang celebrated 10 years of their respective lines, and Coach debuted it's first-ever runway show. 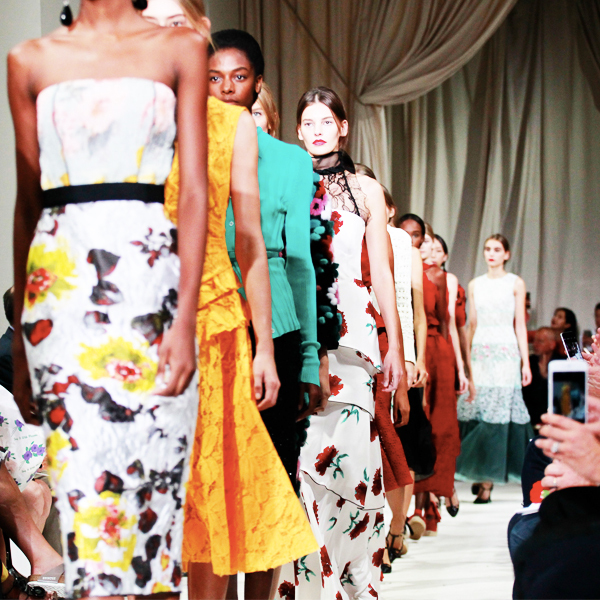 Let's talk about New York Fashion Week! 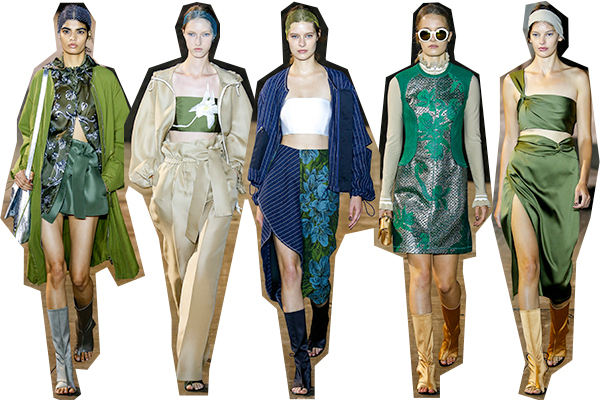 Phillip Lim, how does your garden grow? To celebrate 10 years of his namesake line, Lim presented a collection that was inspired by the earth, by dirt, by how things grow. Models maneuvered around giant mounds of compost dirt in earth-toned ensembles like high-fashion gardeners. Paper bag waists, forest greens, and floral motifs dominated the show. 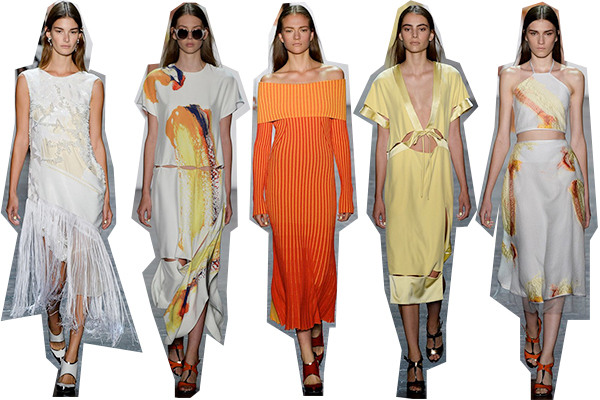 It was the perfect celebration of the Phillip Lim style, both modern and romantic, pretty and tough. I love the idea of growth and nature as a starting point for an anniversary show; if not a bit literal of an analogy of the brand's growth over the past decade, it is clever. Coach has been in the process of revitalizing their brand image, and the next logical step after relaunching their ready-to-wear section was holding its first-ever fashion show. Based on the number of Instagrams from influential bloggers and fashion people at the show, it was a success! For Spring 2016, head designer Stuart Vevers conjured up clothes for a modern-day Laura Ingalls Wilder with a dream to start an 80s-style all-girl rock band. 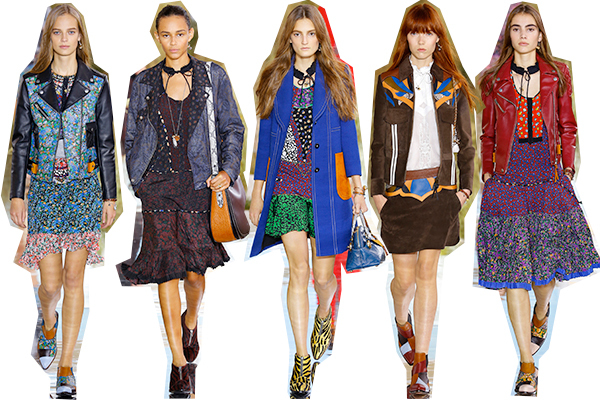 Leather jackets met calico print, Western suedes were paired with neon and leopard, and so on. It's very much on-trend with the Wild West trend of NYFW thus far, and I know the fashion crowd is going to eat these clothes up. When your fashion show begins with thirty monks from Nepal chanting, it is expected that the ensuing collection will be peaceful and serene. Prabal Gurung displayed a stunning tribute to his Nepal roots. When a huge earthquake struck Nepal back in the spring, Gurung launched a social media campaign to raise money for relief efforts, using his influence to do some good in the world. Since then he's gotten a lot of inspiration from the country of Nepal, and this was such a stunning collection that combined the influences of nature, monks, culture, and history with Gurung's unique approach to fashion. I've never thought that orange could be so calming, but you could tell that there was a sense of synergy and connectivity between the clothes and Gurung's points of inspiration. This was by far one of the most refreshing shows so far, and I hope these clothes get the recognition they deserve.